Can coal become a clean energy source? Many Americans regard coal as a high-polluting fuel of the past, but today the U.S. is on the verge of a new coal energy boom. Coal-burning power plants generate half the nation's electricity, and that share could grow. More than 150 new coal power plants are planned or under construction, but critics oppose many of them. Coal is cheap and plentiful compared to other fuels, but it also produces air pollutants that contribute to acid rain, smog and climate change and cause thousands of deaths every year. Supporters say technology can make coal a pollution-free energy source in coming decades and that coal could even be used to make liquid fuels as a substitute for oil. But environmental and health advocates argue that the damaging impacts from mining, transporting and burning coal cancel out its value as an energy source. 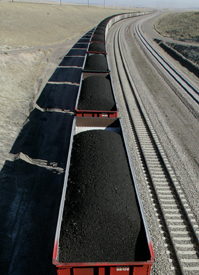 As Congress and the states debate proposals to combat global warming, regulators and businesses weigh coal's energy benefits against its health and environmental liabilities.